Welcome to Rotary Year 2018/2019. I am excited to start our new Rotary year and to share all of our plans and activities with all of you. Please check out our list of upcoming speakers to the left of this message. We will be busy this upcoming month with our installation of new officers as well as our District Governor visit. We are excited to have Paul Sincock as our new District Governor and hope that all members can join us at both events to welcome our new board and to welcome Paul. For this Rotary year, DG Paul has a Top 10 List of Rotary goals. I will share two of them with you now, and save the rest for later. 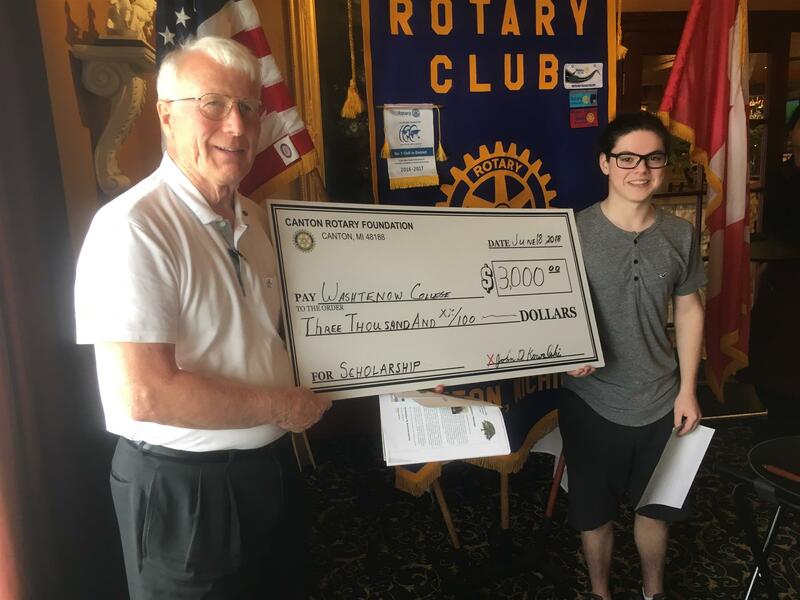 Paul wants to focus on youth by sponsoring 12 inbound and 12 outbound Rotary Youth Exchange students as well as assist in Rotaract and Interact clubs. Do you know of a prospective outbounder or a prospective host family for an inbounder? Another goal of Paul's is participation from all clubs at the Sunday, September 16, 2018, District Governor Golf Outing. Please mark this event on your calendar now, and more information will be coming soon. I look forward to seeing all of you every week of our upcoming year as we Pursue the Dream to Be The Inspiration to each other and to the world. 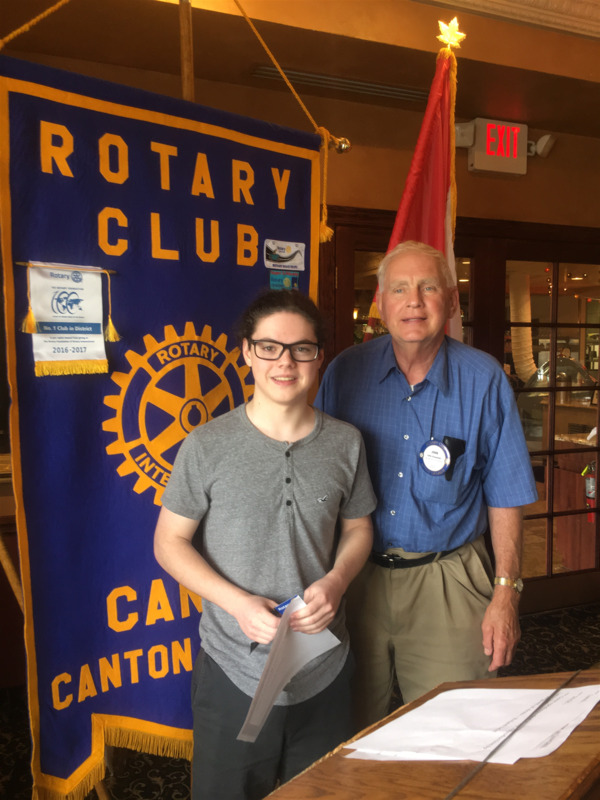 Today we are honored to have our newest 2018 Canton Rotary Foundation Scholarship Award Recipient, Joshua Ruby, and his farther, Tony, with us. Check your calendars as Red Pop night is around the corner. Let John know if you have a change of plans and want to attend. The Canton Fire Fighters have a fund raiser golf outing on Tuesday the 19th. No meeting next Monday, July 2nd, due to the Holiday. 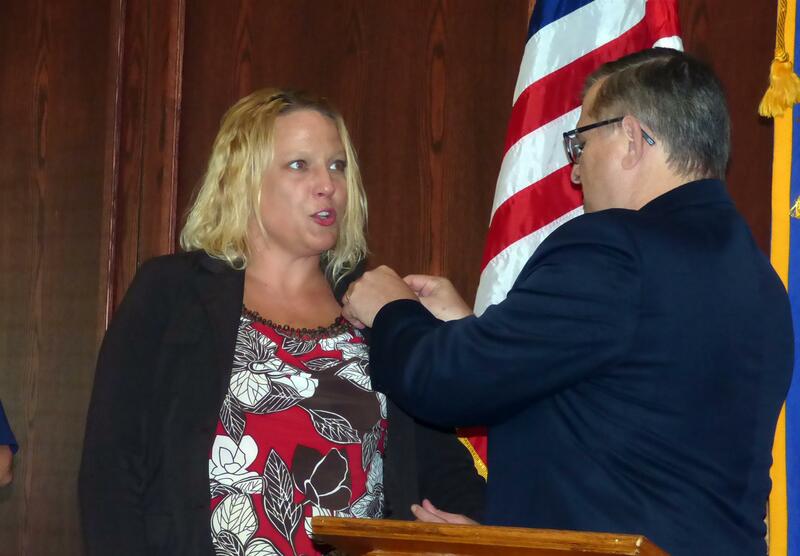 July 9th is an important date as our next Club President, Sue Kowalski, is to be installed. Make sure to make it to this meeting if at all possible to support her and the club for 2018-2019. Note, we had a board meeting and foundation meeting today so the notes on those will circulate to update our records and help plan the upcoming year. Nice work on the budget Sue, and thank you Bill Tesen for the notes on both. Our guest speaker today was Josh, the newest Canton Rotary Foundation Scholarship Award Recipient. His hard work, planning, and dedication to getting a good education earned him a $3,000 scholarship to Washtenaw Community College. Josh took the podium stand and addressed the club, thanking them for the opportunity to begin a new education here in the community, and he filled us in on some of his interests that led to his application. This included all things auto mechanics across the board in autos, breaks are "fun" to do, and he has also tackled some challenging gear box replacements. Now, on to the electronics side too. Our senior founding member Bill Brown (of Bill Brown Auto Repair) was with us as well and offered up some practical tips to help out. Note his birthday was today... 97 awesome! No sergeant today or 50/50 winner (but thanks again Kevin and good try Josh). Today's meal was Pizza. Liberty Fest 2018 and the Canton Rotary Beverage Tent is now a fond memory. 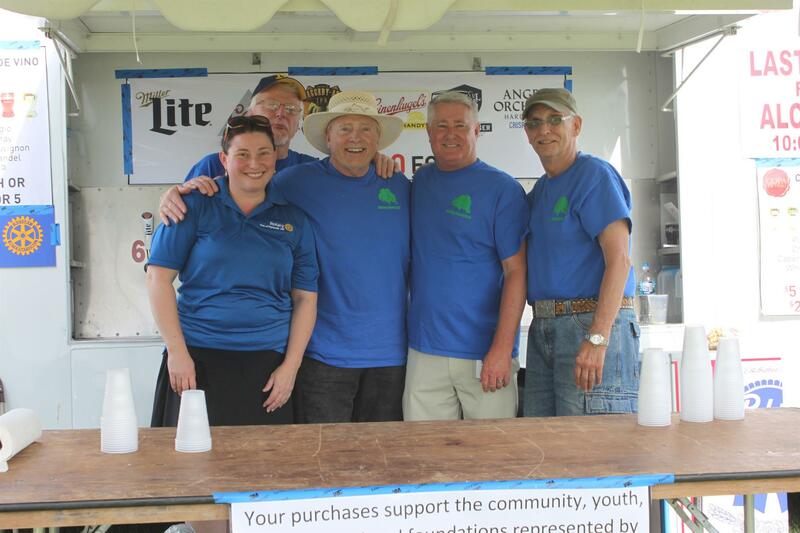 For three days we served beverages to the attendees at Liberty Fest while our Club replenished its funds for our charitable projects for the upcoming year. 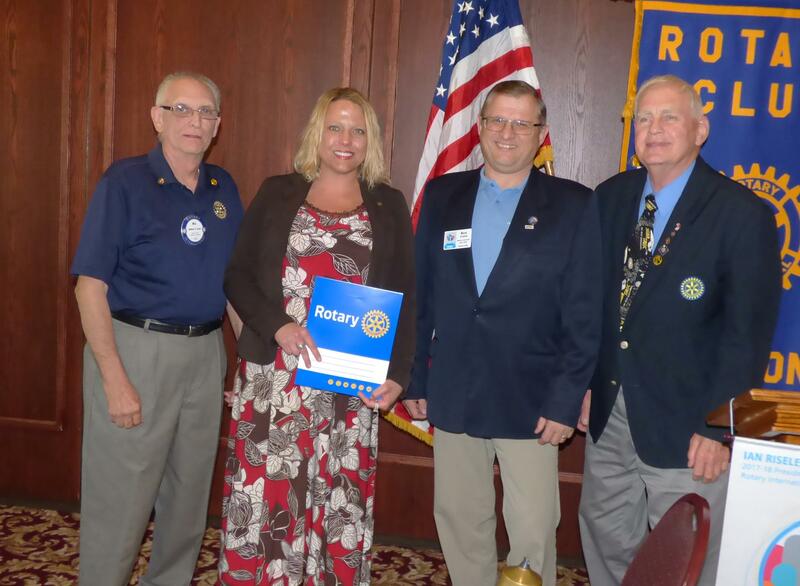 We are pleased to install our newest member today: Marlette Anquetil and welcome her to our club. 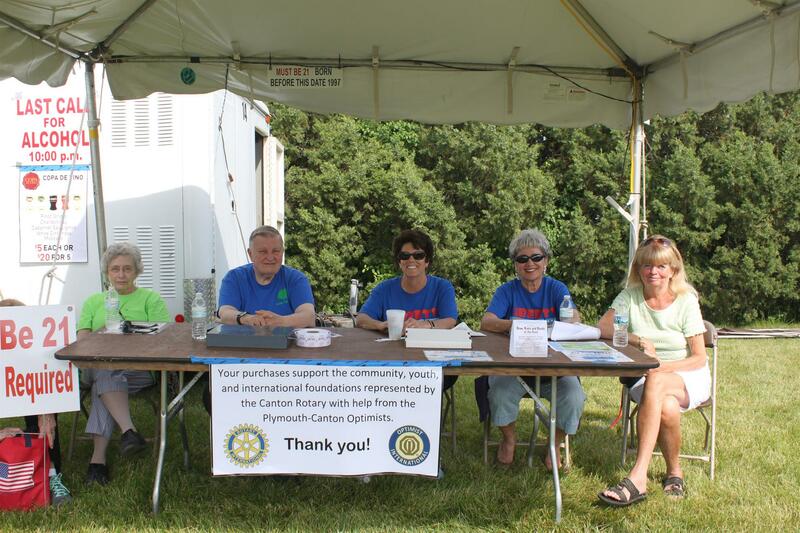 June 13th we plan a walk through with our volunteer helpers, the Optimist club. June 19th is Meet the District Governor Night in Harrow, Ontario, Canada - $35 for dinner plus the cost of the bus (should be around $40). Three members of the club plan to go. Wed. between 9-10am the beer trailer arrives for the early setup crew. A quick Foundation Meeting follows lunch. We were pleased to be joined by DG Rick Caron today for the installation ceremony for our newest member, Marlette Anquetil. Also, photography support is appreciated from PDG Jim Karolyi and the lead singing voice of Jill Karolyi. No sergeant today or 50/50 winner (but thanks Kevin for giving us all a try). Today's meal was chicken cacciatore.